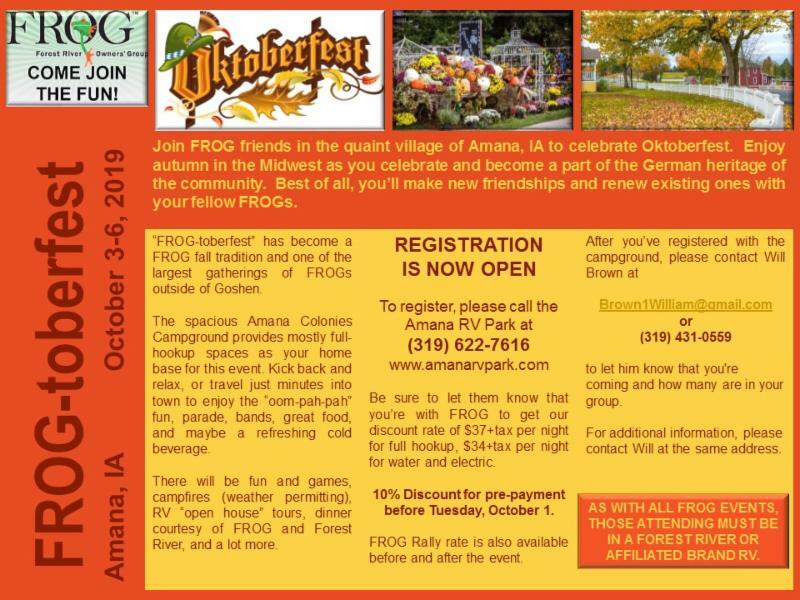 Join FROG in the historic village of Amana, Iowa for in the spendor of a Midwest autumn and the fun of an authentic German Oktoberfest! "FROG-toberfest" is now in its 6th year, and sharing it with FROG friends makes it even more special! You'll enjoy three nights of camping (most sites are FHU), a catered dinner provided by FROG and Forest River, live entertainment, campfires, open-house "RV Crawl," games and more! You're just a few minutes away from the fun and excitement of Oktoberfest. The Amana Colonies' celebration of their German heritage provides wonderful food, fun, entertainment, shopping, and ways to quench your thirst. After you register with the campground, please send an e-mail to Will Brown at Brown1William@gmail.com to let him know that you're coming and how many are in your group.